The aim of Quality Assurance is to document and comment on evaluation methods together with suspicious results. The QA does not perform any corrections. Quality Assurance of data plays an important role in the data publication process as well as for data re-use. However, quality control procedures and quality documentation vary greatly among scientific data. In general every project defines their quality procedures. In order to make the different Quality Assessments of the projects comparable, a generic Quality Assessment System is under development. Based on the self-assessment approach of a maturity matrix, an objective and uniform quality level system for data is derived. It consists of 5 maturity quality levels, starting with the initial level=1. What is the goal of the Quality Assessment System ? Encourage data creators to improve their quality assessment procedures to reach the next quality level. Enable data consumers to decide, whether a dataset has a quality that is sufficient for usage in the aimed application. Different criteria are defined, which are subdivided into aspects. 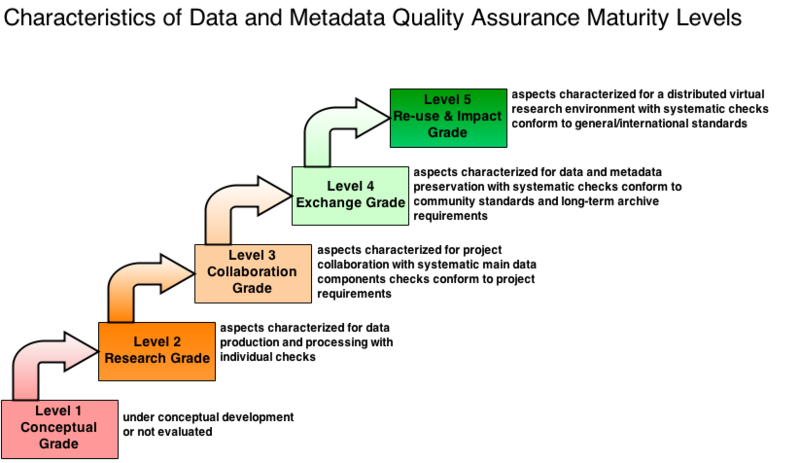 For every aspect the 5 maturity quality levels are defined. The Quality Assessment System is currently developed. The information on this page will be updated as progress is made. Comments and suggestions are welcome. documented procedure about rough anomalies are available e.g. outliers concerning limits. Score 1 is always reached. To achieve a specific desired score level it would be helpful to have a data management plan. This should include the conceptual development. Is the directory structure correct? Are the file sizes feasible for access and transmission? Are the file names correct in accordance to CVs if applicable? Are the file extensions correct in accordance to format if feasible? Is a versioning available if feasible? How is the versioning implemented if feasible? Are CVs applied if feasible? Is data provenance unsystematically documented? Is data accessible by file names? How are creators and data provenance documentation available/accessible by identifier? Is an estimation of technical errors available? Detections of anomalies in model datasets with sources of errors and deviations e.g. technical (Appendix A 1.1)? Is a classification into a level system available e.g. http://www.godae.org/Data-definition.html ? Are missing values indicated e.g. with fill values or in metadata? The checks are documented in project and institute reports (paper, internet and articles). Checks are done and documented under control of project data management. Is a documentation with minimal specification of data organization available? Are the file names or internal identifiers with mapping to objects correct in accordance to CVs? Are the formats and file extensions correct (checked with format checker)? Are the data sizes checked and correct, the size of data set is not equal 0? How is the versioning implemented if feasible? If no explicit versioning exists an implicit versioning could be established. But a good way of versioning implementation is the identification with the date of storage. As soon as more than one version exists versioning should be implemented. Are formal CVs of standard components correct? Are creators/contact e.g. in data headers correct? Is dataset provenance basically documented? Are data accessible by internal identifier? Are internal identifiers with mapping to objects available? Are creators/contact accessible by internal identifiers? How is the technical access implemented? Does an estimation of errors exist? Detections of anomalies in model dataset with methodological sources of errors and deviations. Detections of anomalies in observational dataset with sources of errors and deviations:Does a classification into a level system exist e.g. http://www.godae.org/Data-definition.html ? Detections of anomalies in observational dataset with methodological sources of errors and deviations. The check procedure and check status are available at the repository. Checks are done and documented under control of repository. Is a documentation with specification of well-defined rules of data organization available? Is the storage structure correct e.g. directory, access database tables? Are the entry names correct in accordance to community standards? Are the data formats self-describing, conform to community standards and file extensions correct? Are the data size checked and correct, the size of data set is not equal 0? How is the systematic versioning on files or data collection implemented and applied? If no explicit versioning exists an implicit versioning could be established. But a good way of versioning implementation is the identification with the date of storage. As soon as more than one version exists versioning should be implemented. Are old data versions stored if feasible? Are formal CVs conform to community standards? Are metadata components to a documented procedure correct (components see Appendix A1.3)? Are data entities complete (dynamic datasets – data stream are not effected)? Is the number of data sets correct in accordance to data management plan? Is data overwriting and removing of old versions prevented in accordance to expiration date? Are core metadata components (see Appendix A 1.3) to a documented procedure complete? Is an expiration date of data available? Are permanent (as long as expiration date requires) identifier to data assigned? Are core metadata components (see Appendix A 1.3) accessible by identifier? Are detailed description of data production steps and methods accessible by identifier? Does a classification into a level system exist e.g. http://www.godae.org/Data-definition.html ? Is a documented procedure about shift in mean, variance and trends available? Is a documented procedure about random errors (inherent uncertainties of measurements see Appendix A 1.4) available? Check procedure and check status are available and meet documentation standards at long-term archive with status of QA criteria. Checks are documented under control of long-term-archive. Is a documentation with specification of standardized rules of data organization available? Are the entry names correct in accordance to standardization? Are the data formats self-describing, conform to general standards and file extensions correct? Are the data objects fully machine-readable with reference to sources? Which external objects exist and are they consistent to data object? Are formal CVs conform to international standards? Is the documentation of not included newer versions correct? Are external metadata and data consistent? Are core metadata components (Appendix A 1.3) are complete and available with international standards like ISO 19135? Does a documentation of the data provenance chain exist? Are global resolvable, permanent (as long as expiration date requires) identifier (PIDs) to data assigned? Is data accessible within other data infrastructures? Is a data backup available? Is the documentation of the provenance chain accessible by identifier? Are general/standardized metadata accessible by global resolvable identifier? Is a backup of metadata accessible by global resolvable identifier or does a recovery system exist? Is a documentation of provenance chain including internal and external objects accessible by global resolvable identifier? -Detections of anomalies in model dataset with methodological sources of errors and deviations. -Does a classification into a level system exist e.g. http://www.godae.org/Data-definition.html ? -Detections of anomalies in observational dataset with methodological sources of errors and deviations. Are references to the evaluation results with methods available? These descriptions are very detailed and should be published in a journal. For the model data, these include the description of the models, components and their equations. This is also very detailed and should be published in a journal. E.g. http://www.geoscientific-model-development.net/ project or institute reports. -Resolution in time and space, dependencies of time and space resolutions (what happens if wind speed is stronger than the grid cell represents). Are there descriptions in table form?